My husband and I absolutely love Vince Vaughn, Ben Stiller and Jonah Hill. These three actors are hilarious in pretty much every role they play. The Watch was no different. 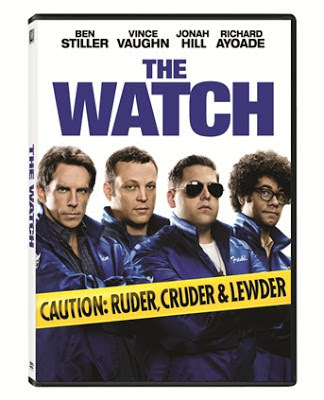 This was the first time seeing Richard Ayoade in anything, but he was pretty funny as well. Although the story line wasn't anything like I thought it was going to be when I first saw the trailer for this, the movie still had its funny parts. I have to admit, this wasn't the best movie I've seen these guys in and I was hoping for something better and much funnier since you had a great cast. There were times where we could pretty much figure out what was going to happen, but then there were times when both my husband and I had no idea what was going to happen next, which shocked us. There were also times when we thought some of the parts in the movie were overdone, but overall this was an okay movie to watch. Disclosure: All opinions are my own. I received The Watch at no cost for the purpose of this review. No other compensation was received.